Lenzner Tour and Travel Goblin' Up the Music! Enjoy a spooktacular fun event at the New Amish Country Theater in Berlin, Ohio! Travel to the Millersburg and Berlin area of Ohio for a spooktacular fun event at the NEW Amish Country Theater! Wear your costumes for fun prizes - optional, of course. 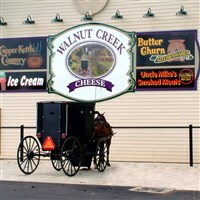 Visit Walnut Creek Cheese, which supplies Amish Country with the area's finest cheese, fresh meat, bulk foods, produce, and more! Have fun Trick or Treating on Main Street in the village of Berlin. Shopping time featuring quilts, crafts, furniture, antiques, and more! Next, enjoy a fun feast and treats for lunch. Experience the Goblin’ Up the Music Show hilarious 2-hour Halloween themed variety show for the whole family! You'll experience brand new parody songs and crazy Halloween costumes unlike anything you've ever seen. Get ready for a rip-roaring good time! Includes: Transportation, lunch, admissions per itinerary, meal and guide gratuities, and taxes.